Carteret County Task Force members and organizations have been working together to address underage drinking and prescription drug misuse and abuse. Reduce substance use in Carteret County. The coalition will collaborate with community stakeholders to reduce substance use among youth and adults. The coalition seeks to improve communities’ health and safety through education and prevention efforts. Coastal Coalition for Substance Abuse Prevention (CCSAP) and Carteret County Health Department are hosting “Making Great Strides for a Healthier Carteret County Recovery Resource Fairs & Town Hall Meetings to address underage drinking and substance abuse every September. It is a free event that gives the community exposure to the available resources in Carteret County and provides a better understanding of the substance abuse issues in the community. The Carteret Task Force has lock boxes and educational materials about drop-off locations that we give out. We also have a wonderful brochure about Nonpharmaceutical Interventions to manage pain, which you can find by clicking here. Carteret County Sheriff’s Department now carries naloxone, the opioid overdose reversal drug, in patrol cars. To find more information about this important life-saving drug, click here. There are drug drop off boxes at all local law enforcement offices in Carteret County. Also, two “Operation Drop Off” are hosted twice a year (March and October) at all five (Atlantic Beach, Emerald Isle, Newport, Morehead City, and Beaufort) Food Lions in the County. The next one will be March 23rd, 2019. 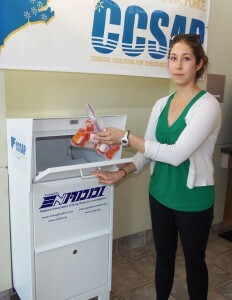 To find the nearest medication drop box, click here. This handout is also a great resource that you can print out that lists all the different med drop locations.